I have always loved Jersey and visit around 3 times a year, during my short breaks I have never used a metal detector on the island. I got an invite from Reg Mead and Richard Miles they wanted me to give them a short XP Deus training session the next time I visited the island, my tickets were booked the next week. 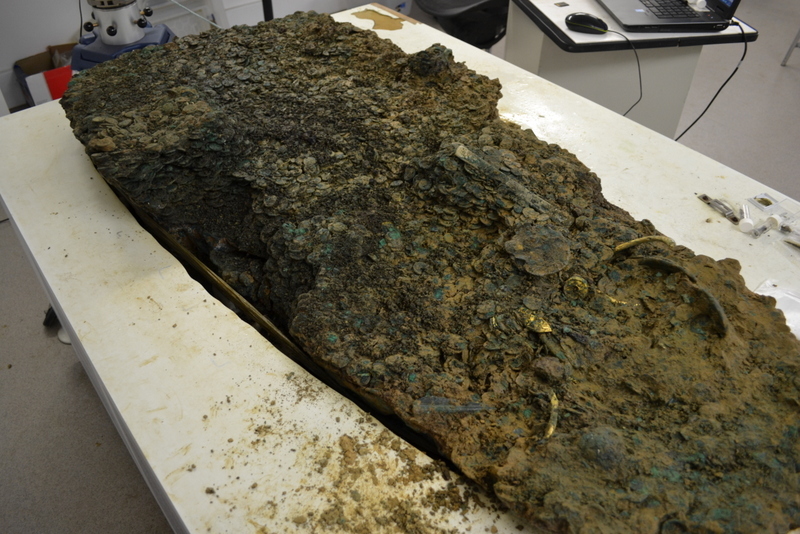 For those of you who have been in hibernation since 2012, Richard and Reg found the Jersey hoard hoard called Catillon II consisting of 70,000 coins, even now they are still picking through the mass that originally weighed just under a ton. It now rests in the La Hougue Bie museum Jersey where it is being dis assembled recorded and cleaned. Their quest for the hoard started 30 years ago after Reg had been talking to the land owner and she mentioned her uncle had up routed a tree and hundreds of coins started to appear from the ground. The events leading up to the find makes me think the whole thing was just meant to be ! Richard and Reg talk more about the events on our video which will soon released. Our flights landed and within an hour Reg picked Stuart and myself up from the Grand Jersey Hotel and took us to the hoard site where we were greeted by Richard. 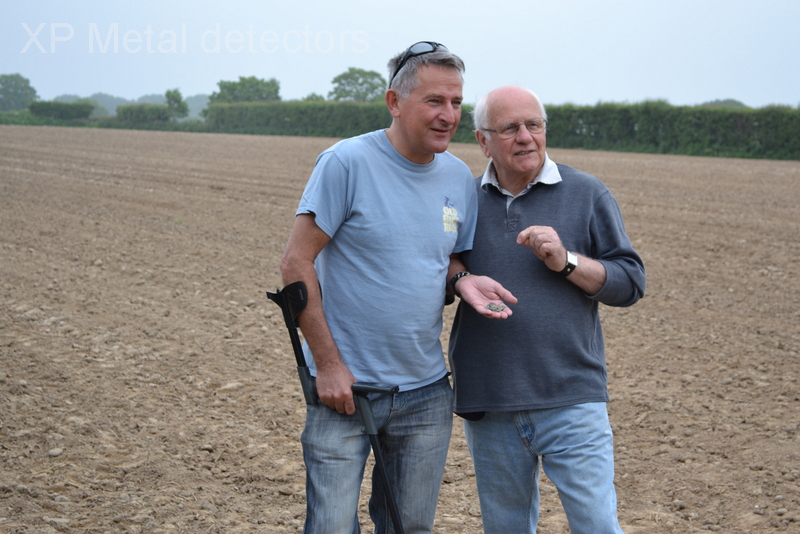 We all instantly hit it off and the banter started, Reg said if you find just one coin I will be very impressed…So the challenge was on… I could see these 2 guys were very accomplished detectorists and knew their way around a metal detector. 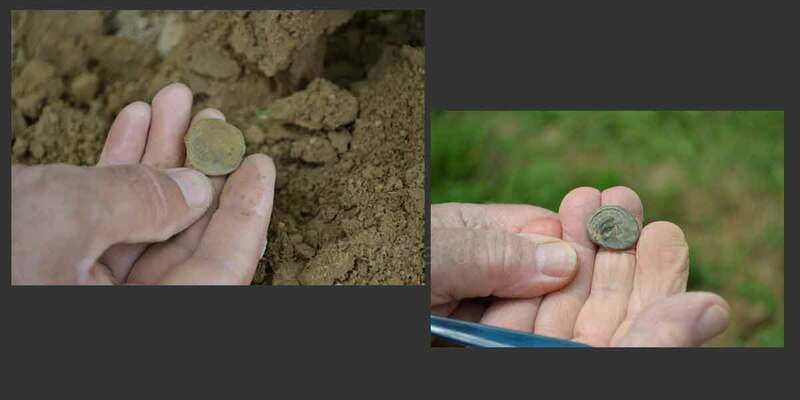 Firstly we talked about the Deus then made some adjustments to suit the soil conditions and the desired targets, which were Silver Celtic coins called Billion, a large part of the hoard coins came from the French Coriosoliate tribe 50 Bc. 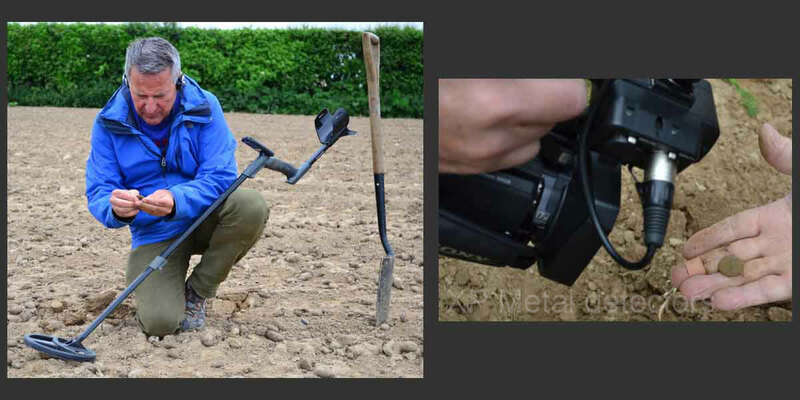 The soil was very Loamy, covered in rejected potatoes yet easy to dig, Stuart filmed as Reg and Richard got underway with the Deus, I rigged up another set of Ws4’s so the audio could be relayed between all 3 of us and I could make observations about target sounds. I noticed a lot of vehicles just cruising around, slowing down and driving off again, I asked Reg who were they ?, he went on to say they were locals and farmers who patrol the area day and night and adopt a shoot first and ask questions later policy, I was so glad we were guests of Reg and Richard. 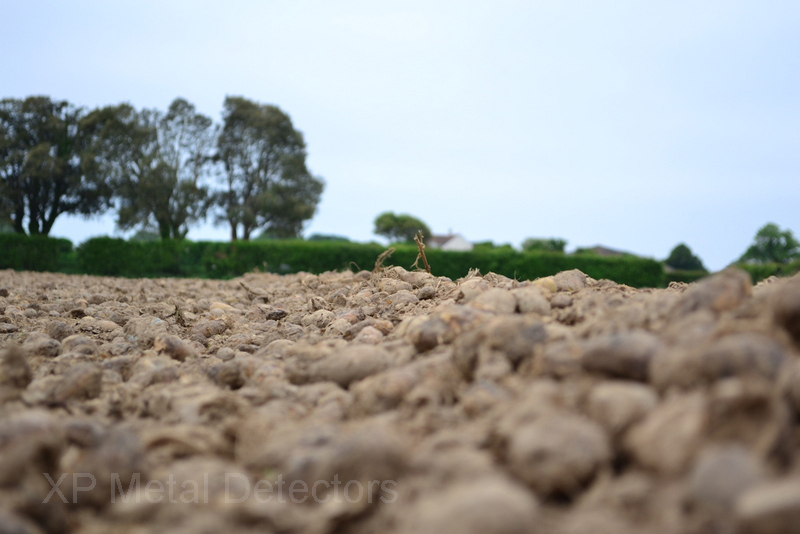 It wasn’t long before the Deus announced a positive signal which turned out to be junk, a melted piece of heavy foil, then Richard dropped a bombshell, he said some of the fields were covered in a type of green waste, many years ago some bright spark advised the Jersey farmers to spread the spoil from the incinerator over the fields to help break down the soil. 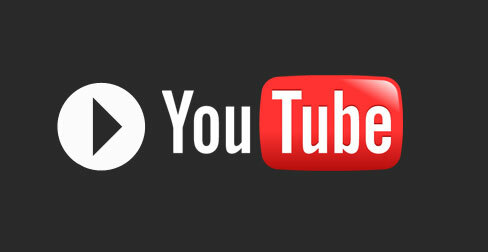 Great so we were searching for Celtic coins amongst green waste, this would make a fantastic video….NOT ! Fortunately the guys had done a pretty good job clearing the hoard site, it wasn’t long before the Deus sang out again, a positive 84 on the meter, bingo !, Richard found our first coin, Reg jumped in to see armed with his famous toothbrush, they now call Reg the scubologist at the museum as he wanted a formal archaeological role. It was confirmed our first coin was found with the Deus. Reg jokingly said to Richard that we had already started to make them look like amateurs, I looked up at Stuart who grinned and raised an eyebrow from behind the camera. I knew why, it’s because on the plane flying over we talked about the film and how nice it would be to get just one coin coming out on camera, it would make a nice scoop and make the journey worth while. The guys quickly tuned their ears into the Deus and found a further 7 coins, making a total of 8 in about 3 hours, this short session blew their minds, we decided to get some lunch and calm things down a little. After lunch we did some more filming in another part of the island and headed back to the hotel for tea and medals. What a fantastic first day in Jersey 8 coins and we hadn’t unpacked or even seen our hotel rooms…. I have to say Stuart and myself were totally in awe of Richard and Reg, not because they have found a hoard but the friendship they have, 2 really fantastic guys who are passionate about the hobby, they have still remained friends all through the hoard experience, which we know in the past has ruined friendships and even marriages. 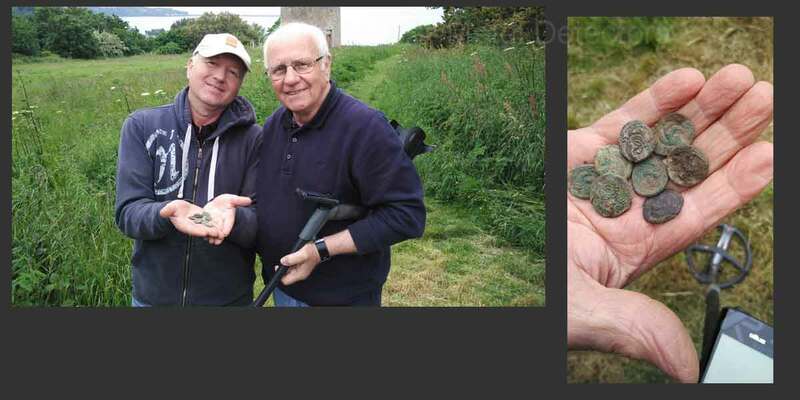 They have remained level-headed and not reacted to the media when they are called “Treasure Hunters” which all detectorists hate to be branded, they are simply 2 great guys who were fortunate to find a hoard of coins. They did the right thing and declared the hoard to the authorities…In turn the archaeologists welcomed Reg and Richard into their workplace and trained them in cleaning(scrubology), conserving, identifying and recording. 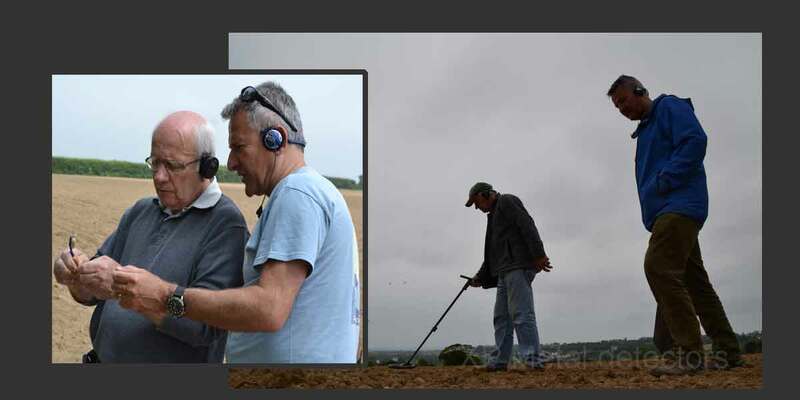 Now thanks to their honesty and the fact they are decent human beings, these 2 detectorists have moved up a level and are now experts in the field of Jersey Celtic coinage. It’s great to see Reg and Richard interacting with the public at the museum where they now work on a voluntary basis.